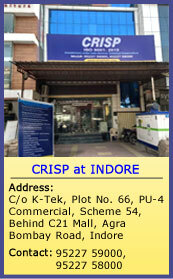 Centre for Research and Industrial Staff Performance, (CRISP), Bhopal has been established in the year 1997 as a Society under the Indo –German Technical Cooperation agreement. Ministry of MSME, Government of India was the line ministry for this project whereas the Department of Technical Education & Skill Development, Government of Madhya Pradesh and German Technical Cooperation agency (GTZ) were the implementation partners. It is headquartered in Bhopal with national & international operations dedicated to human resource development & organizational development. These activities are targeted at Government, Industries, Academic Institutions, Developmental Organizations as well as the Civil Society. A nodal Centre for Department of Technical Education & Skill Development Government of Madhya Pradesh for technical and management staff capacity building. More than 500 delighted clients from Industries, Central & State Government Organizations, Academia, Developmental Organizations etc. A role model for German Technical Co-operation Agency (GTZ) for replicating CRISP like successful Project in India and other countries. Practicing professional & management principles in our operations. Facilitating applications of e-Governance for State Govt. of Madhya Pradesh. A strong team of qualified & experienced employees (more than 150) capable of handelling technical and educational projects within India & overseas. Manufacturing Technology (CNC Technology, CAD/CAM (Unigraphics, Pro-E, CATIA, Solid Works & I-DEAS), AutoCAD. Industrial Automation (PLC, Variable Frequency Drives, Field Instrumentation, MMI, Hydraulics, Pneumatics). Mechatronics: Mechanical, Electrical, Electronics, Instrumentation, IT. Behavioral Sciences and Management (Leadership Development, Communication Skills, Team Building etc.). Information Technology (Application & Software Development, Hardware & Networking Training, Web Designing etc.). Vocational Education & Training (Design & development of curriculum & study materials, Train The Trainers, Instructors Training, Trade identification survey, impact study etc).